Moab Utah is well known for its arches; Arches National Park is located just north of Moab. A lesser known but equally as beautiful arch is located outside the park. 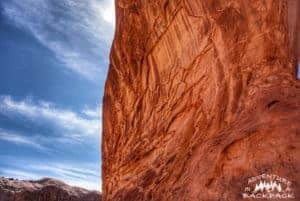 We decided on hiking Corona Arch in Moab on our first full day in Moab. Corona Arch is located on BLM (Bureau of Land Management) land, so the hike is free and there are no entrance fees. 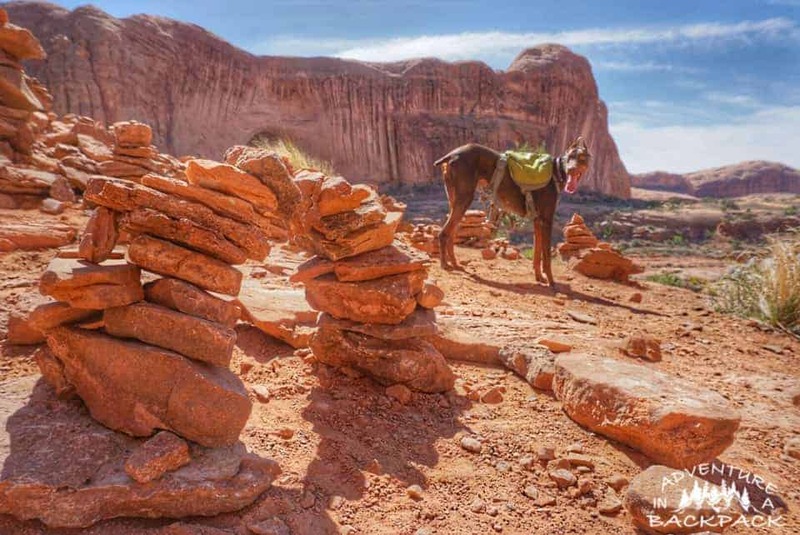 Dogs are also allowed on most BLM land (unless otherwise posted), which is very appealing for us! 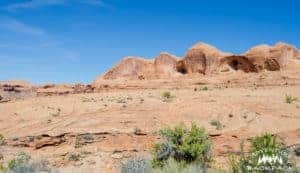 The Corona Arch Trail is about 1.5 miles to the arch, approximately 3 miles roundtrip. The trail is moderate, as there is some slight scrambling necessary, although there is a cable to help you up. The trail is well marked and heavily traveled. On our hike, it was not overly busy although there were many other people at the arch. We never felt crowded, and everyone on the trail was friendly. We had a great time hiking Corona Arch, and the pups had a great time as well. It was a beautiful day and we were all excited to be having some adventures! 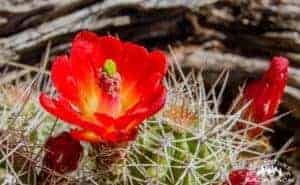 This is a great hike for families, as well. There were many children on the hike and they all seemed to be having a great time. Our pups were a hit, too, as they are very friendly to everyone on the trail! The only downside that I can really think of on this trip was the graffiti on the arch. This is something that saddens us greatly to see these natural wonders be marked up and destroyed by people. But, if you take a step back and look at the arch as a whole, it is still amazingly beautiful and a definite sight to see! 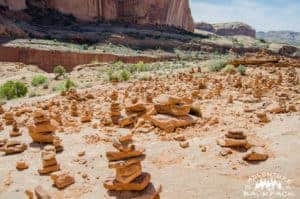 We highly recommend this hike for anyone visiting Moab Utah! 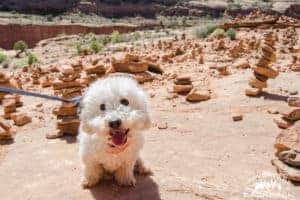 Corona Arch was a moderate hike for all of us, and we could tell the pups were out of hiking shape! They came back to the RV and crashed, but we continued into Arches National Park after taking them home. You definitely need to be sure to check the weather conditions and ensure it isn’t too hot to take the pups with you, and bring plenty of water. We even had their hiking boots with us in case the rocks got too hot on their paws, but we never needed them on this hike. If you do bring your pups, be sure to practice Leave No Trace and pack out any messes they make. This is a good practice no matter where you are. We spotted your RV and gear in tow at the Hog Springs rest stop on Hwy 95 in Utah and wondered what the ‘story’ was. How great to find your blog! May you have the best of luck in your adventures! That’s awesome Cat! I guess the stickers worked! Haha. Thanks for checking us out.